NASA has reached an important milestone for the next U.S. transportation system that will carry humans into deep space. NASA Administrator Charles Bolden announced today that the system will be based on designs originally planned for the Orion Crew Exploration Vehicle. Those plans now will be used to develop a new spacecraft known as the Multi-Purpose Crew Vehicle (MPCV). Above: The Multi-Purpose Crew Vehicle being assembled and tested at Lockheed Martin's Vertical Testing Facility in Colorado. "We are committed to human exploration beyond low-Earth orbit and look forward to developing the next generation of systems to take us there," Bolden said. "The NASA Authorization Act lays out a clear path forward for us by handing off transportation to the International Space Station to our private sector partners, so we can focus on deep space exploration. As we aggressively continue our work on a heavy lift launch vehicle, we are moving forward with an existing contract to keep development of our new crew vehicle on track." Lockheed Martin Corp. will continue working to develop the MPCV. The spacecraft will carry four astronauts for 21-day missions and be able to land in the Pacific Ocean off the California coast. The spacecraft will have a pressurized volume of 690 cubic feet, with 316 cubic feet of habitable space. It is designed to be 10 times safer during ascent and entry than its predecessor, the space shuttle. "This selection does not indicate a business as usual mentality for NASA programs," said Douglas Cooke, associate administrator for the agency's Exploration Systems Mission Directorate in Washington. "The Orion government and industry team has shown exceptional creativity in finding ways to keep costs down through management techniques, technical solutions and innovation." As NASA closes the chapter on the Space Shuttle Program, a new era of exploration vehicles is beginning to take off. Testing began this month at NASA's Langley Research Center in Hampton, Va., in the new Hydro Impact Basin to certify the Orion Multi-Purpose Crew Vehicle (MPCV) for water landings. The Orion MPCV will carry astronauts into space, provide emergency abort capability, sustain the crew during space travel and ensure safe re-entry and landing. Engineers have dropped a 22,000-pound MPCV mockup into the basin. The test item is similar in size and shape to MPCV, but is more rigid so it can withstand multiple drops. Each test has a different drop velocity to represent the MPCV's possible entry conditions during water landings. The last of three drop tests to verify the new facility is scheduled for the end of this month. Testing will resume in September with a slightly modified test article that is more representative of the actual MPCV. The new Hydro Impact Basin is 115 long, 90 feet wide and 20 feet deep. It is located at the west end of Langley's historic Landing and Impact Research Facility, or Gantry, where Apollo astronauts trained for moon walks. Standing five stories tall fully stacked, the Launch Abort System was mounted atop the Orion MPCV, or Multi-Purpose Crew Vehicle, last week at the Lockheed Martin's facilities near Denver. 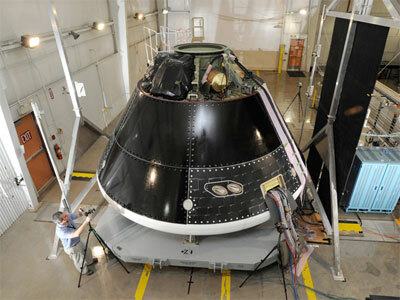 Orion is being prepared for the next round of testing in an acoustic chamber. Each test will expose the Orion MPCV and its launch abort system to acoustic levels exceeding 150 decibels while instruments record the vehicle's response. The test vehicles will provide critical data used to model the spacecraft's capabilities to perform deep space exploration missions. The vehicles will undergo testing at sound pressure levels that emulate those experienced at launch and in the event an abort is needed to carry the crew to safety away from a potential problem on the launch pad or during ascent. See here for discussion of the Multi-Purpose Crew Vehicle. Construction began this week on the first new NASA spacecraft built to take humans to orbit since space shuttle Endeavour left the factory in 1991, and marked a significant milestone in carrying out the vision President Obama and Congress have laid out for the nation. Engineers at NASA's Michoud Assembly Facility in New Orleans started welding together the first space-bound Orion Multi-Purpose Crew Vehicle (MPCV). "The Orion team has maintained a steady focus on progress, and we now are beginning to build hardware for spaceflight," Orion program manager Mark Geyer said. "This marks a major milestone in NASA's ambitious plans to send humans farther into space than the nation has ever been before," NASA spokesman David Weaver said. "We're not only working to send people into deep space, we are putting people to work right here in America." The first welds were completed Friday using an innovative new friction stir welding process, developed especially for Orion MPCV construction. The process creates a seamless, leak-proof bond that has proven stronger and higher in quality than can be achieved with conventional welding. 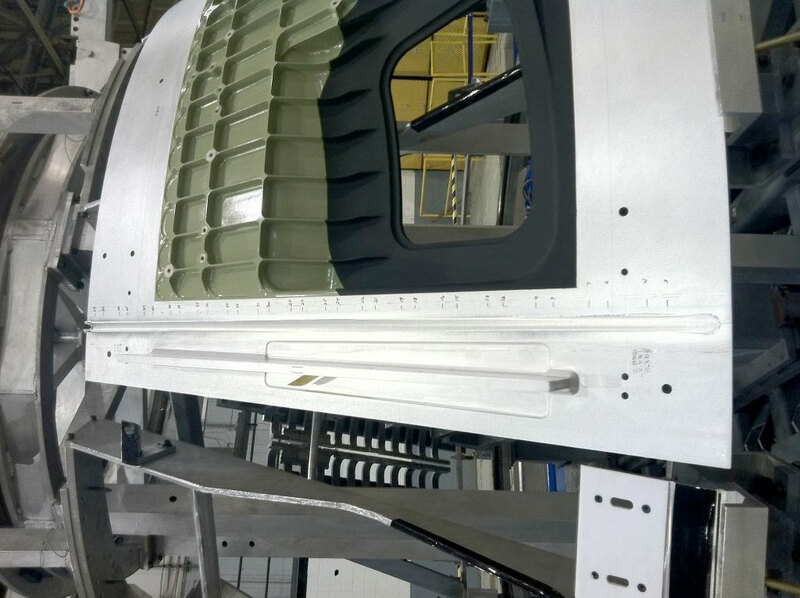 Above: The smooth line to the left of the window is the Orion OFT1 spacecraft's first weld. 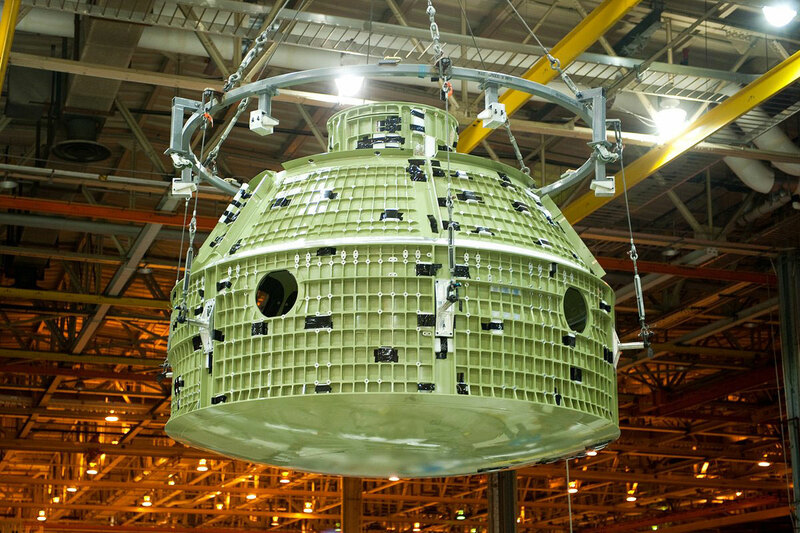 After welding is completed at Michoud, the Orion spacecraft orbital test flight (OFT) article will be shipped to the Kennedy Space Center in Florida, where the heat shield will be installed. At Kennedy, it will undergo final assembly and checkout operations for flight. The Orion team at the Michoud Assembly Facility completed the final weld on the Exploration Flight Test 1 (EFT-1) vehicle. The EFT-1 Orion will be shipped to the Kennedy Space Center next week for final assembly and checkout operations. An event marking the arrival of NASA's first space-bound Orion spacecraft will take place at 10 a.m. EDT, Monday, July 2, at Kennedy's Operations and Checkout Building and be carried live on NASA Television and the agency's website. 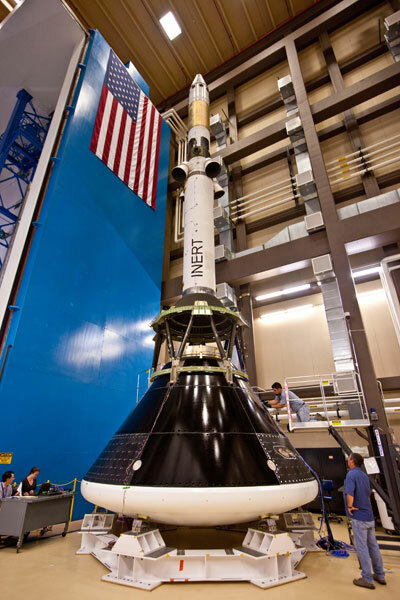 NASA participants will discuss progress made to-date on final assembly and integration of the spacecraft, which will launch on EFT-1, an uncrewed mission planned for 2014. This test will see Orion travel farther into space than any human spacecraft has gone in more than 40 years. 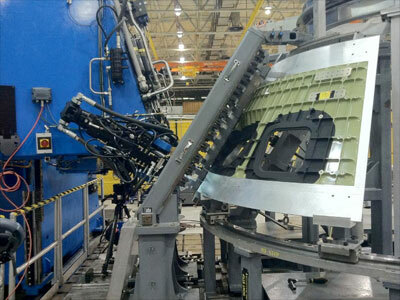 In advance of its launch from Cape Canaveral Air Force Station, Fla., the Orion production team will apply heat shielding thermal protection systems, avionics and other subsystems to the spacecraft. Additionally, NASA will host an interactive session from 11:45 a.m. to 12:30 p.m., with agency leaders and Orion program managers to answer questions from followers of NASA's social media accounts. Followers on Twitter can ask a question during the event using the hashtag #askNASA. On NASA Facebook and Google+, a comment thread will open for questions the morning of the event. for NASA's 2014 Exploration Flight Test (EFT-1).